Here are a couple of pics of us in a slight depression, providing a pretty nice temporary hide. I’m shooter, and Spc. Witt is behind the spotting scope in these pics. 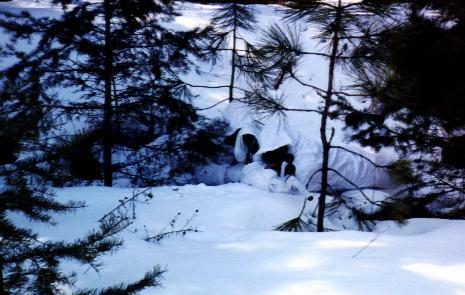 The problem with sniping in snow is the amount of time we spend doing…. nothing! 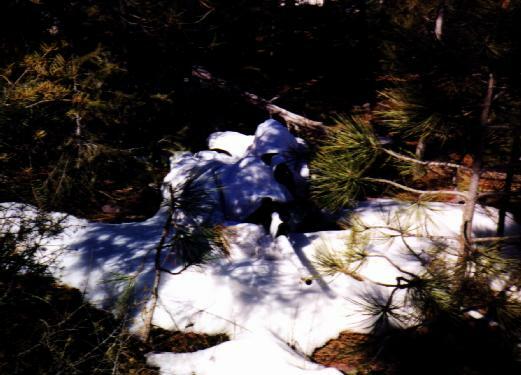 Just laying in the snow is a good way to get frost bite, or even worse. You must be prepared with lots of insulation, especially on your front, and don’t be afraid of cheating, i.e. little chemical warmers to stuff in the mittens and boots. And yes, this is one of the GOOD opportunities to utilize those awkward mickey mouse boots. This is an excellent example of how awesome shadows can be. 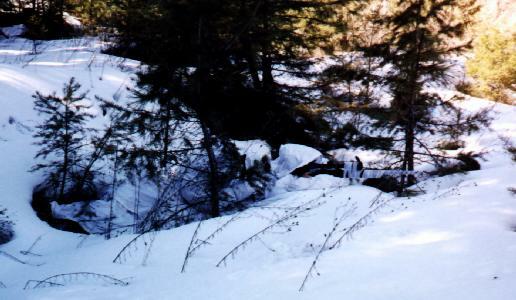 The bright white glare from the patch of snow all but makes the rest of us disappear in deep shadows. Shadows can be your best friend, but be careful…. they like to move! Make sure you don’t stay in a spot for a while, and then notice your out in the bright sunlight!